17th Anniversary on the Web! 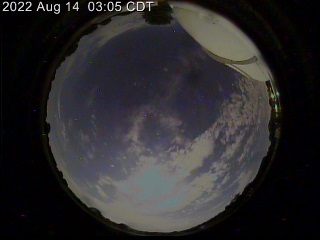 Live image of sky from observatory. Click for info. Feb 12, 2012: I discovered a comet! Jul 8, 2010: Start reporting our trip to Tahiti for the total solar eclipse. March 4, 2009: Added info about the Leonid Meteor Shower expedition. July 23, 2008: Start reporting on Mongolian Total Solar Eclipse. July 10, 2008: Added images from 2008 Southern Skies Star Party. August 23, 2007: Added images of 2007 Perseid Meteor shower with 253 Perseids! August 13, 2007: Split up meteor photos into their own page. October 29, 2005: Added movie of Mars, the best photos I have ever gotten of the red planet. July 23, 2005: Debut of all sky camera. July 3, 2005: Added image and animation of Deep Impact / Comet Tempel 1 impact. December 15, 2004: Added image and animation of Geminid meteor shower. August 25, 2003: Added image of Mars. Updated Nebulae, Galaxies, and Clusters with newer (better) images taken with my new ST-7XME camera. July 11, 2003: I was able to take a photo of one of the Mars Exploration Rovers enroute to Mars. February 1, 2003: Posted photos of the Space Shuttle Columbia breakup as seen from San Diego, CA. Please check out my home page for more cool stuff! I also have pages covering electronics and seismology. Comments? Questions? Click here to send email to me. All text and images are © 1995-2005 Manfred Bruenjes - All Rights Reserved. Image inlining is strictly prohibited. Email for permission before using an image or text.